The Paxton Boys struck Conestoga Indiantown at dawn on December 14, 1763. 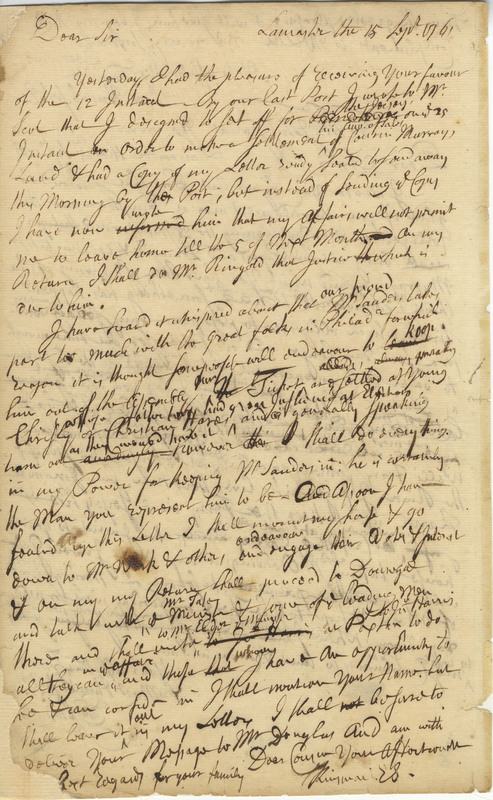 “Fifty-seven Men, from some of our Frontier Townships,” Benjamin Franklin later reported in his Narrative of the Late Massacres in Lancaster County, “came, all well-mounted, and armed with Firelocks, Hangers and Hatchets, having travelled through the Country in the Night, to Conestogoe Manor.” Only six Indians were in the town at the time, “the rest being out among the neighbouring White People, some to sell the Baskets, Brooms and Bowls they manufactured.” The Paxton Boys killed these six and burned Conestoga Indiantown to the ground. The Conestoga Indians lived on a 500-acre tract near the town of Lancaster, which William Penn had set aside for them seventy years earlier. Once an important center of trade and diplomacy, Conestoga Indiantown was in terminal decline by 1763, with a population of only twenty–seven men, five women, and eight children. They survived by raising corn, begging at local farms, soliciting food and clothing from the provincial government, and selling their brooms and baskets. The remaining fourteen Conestoga Indians were removed to the Lancaster jail for their safety, but on December 27 the Paxton Boys rode into town in broad daylight and finished the job they had started two weeks earlier. 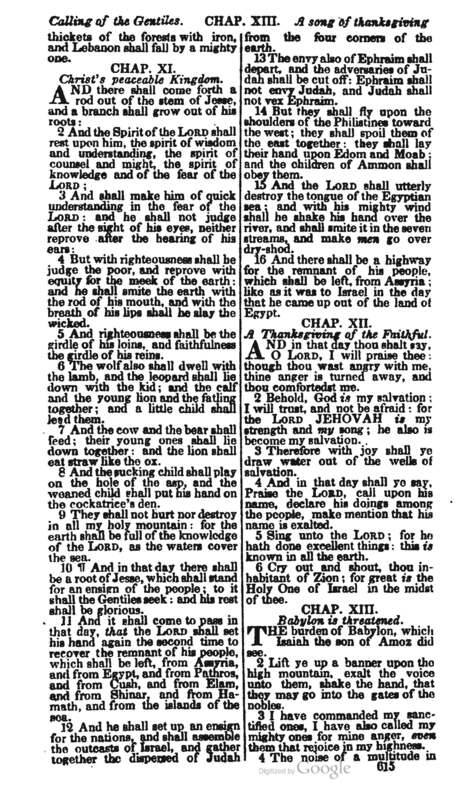 Fifty men, “armed as before, dismounting, went directly to the Work-house and by Violence broke open the Door,” Franklin observed, “and entered with the utmost Fury in their Countenances.” They slaughtered the fourteen Indians sheltering inside, including the eight children. The Paxton Boys were fully aware of the symbolic significance of their actions. They exterminated defenseless, non-belligerent Indians to make the point that all Indians were the same. And they slaughtered the Conestogas on government property. In perpetrating the massacres, they deliberately repudiated the Indian policy of William Penn. Inspired by Quaker principles of compassion and tolerance, Penn had founded his colony in 1682 as a “holy experiment” in which Christians and Indians could live together in harmony. He referred to this ideal society as the “Peaceable Kingdom.” The nineteenth-century Quaker artist Edward Hicks produced a series of allegorical paintings of the Peaceable Kingdom, based on a theme from the Book of Isaiah, in which he always included Penn’s legendary (and probably mythical) meeting with the Delaware Indians under the elm tree at Shackamaxon, in present-day Philadelphia. In pursuit of his harmonious vision, Penn treated the Indians in his province with unusual respect and decency. 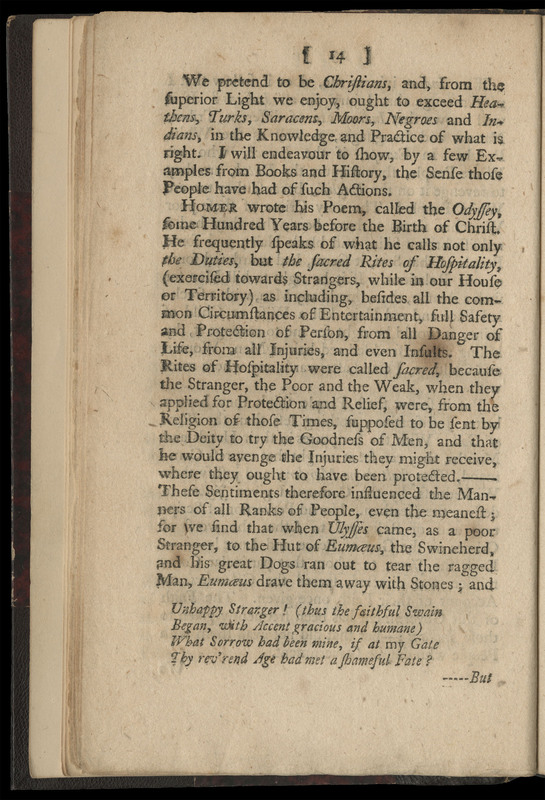 (For Penn’s use of the term “holy experiment," reference "John Penn to James Harrison" in Further Reading). The Conestogas revered him, his children, and his grandchildren. For all Penn’s decency, however, his holy experiment rested firmly on colonialist foundations. 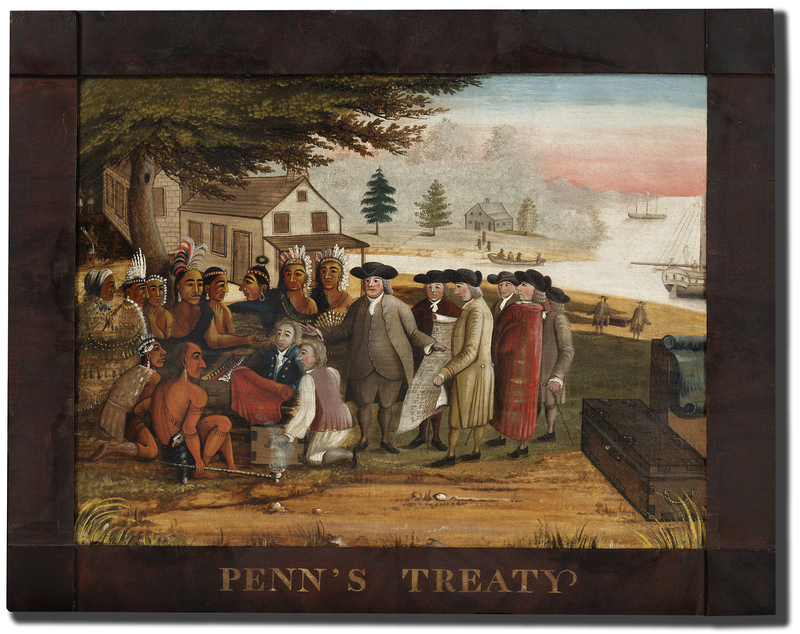 Pennsylvania was founded on the basis of a gift of 29 million acres from Charles II, which made William Penn the largest individual landlord in the British Empire. 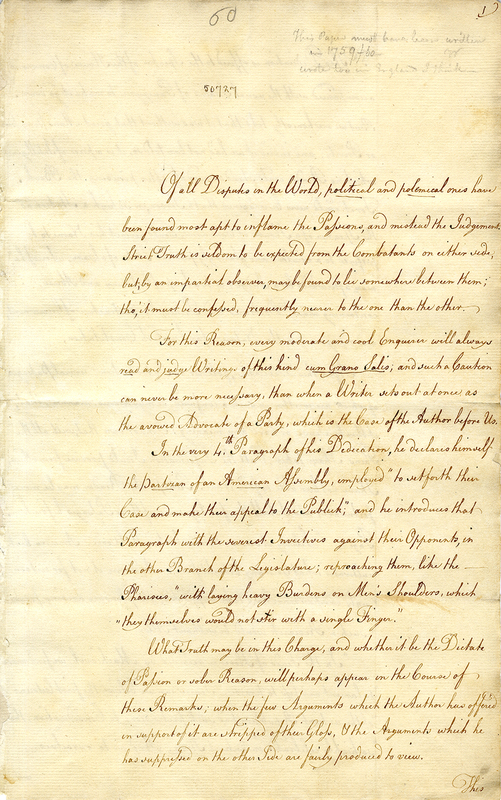 Within his charter, Penn purchased land from Indians fairly and openly. But his motives were not purely altruistic. Purchasing the land through legal mechanisms freed it of prior claims and titles, at least from the English perspective, so that Penn could sell it to settlers and begin to recoup the vast expenses incurred in setting up his colony. 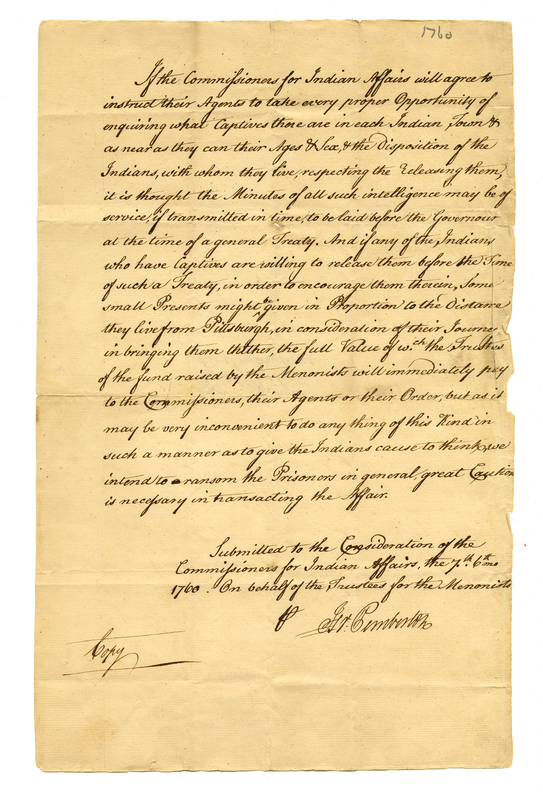 Penn wanted harmony with Indians, but he also needed to own their land outright. Native Americans, by contrast, believed that land could be sold only temporarily and could not be alienated permanently from the tribe or nation that held it in trust. For this fundamental reason, Penn’s holy experiment could never properly take root. Already in decline by the time of William Penn’s death in 1718, the Peaceable Kingdom disintegrated over the next few decades and collapsed during the Indian wars of the 1750s and 1760s. When Penn’s son and principal heir, Thomas, reverted to Anglicanism, he cast off the Quaker faith and, with it, his father’s humane benevolence. 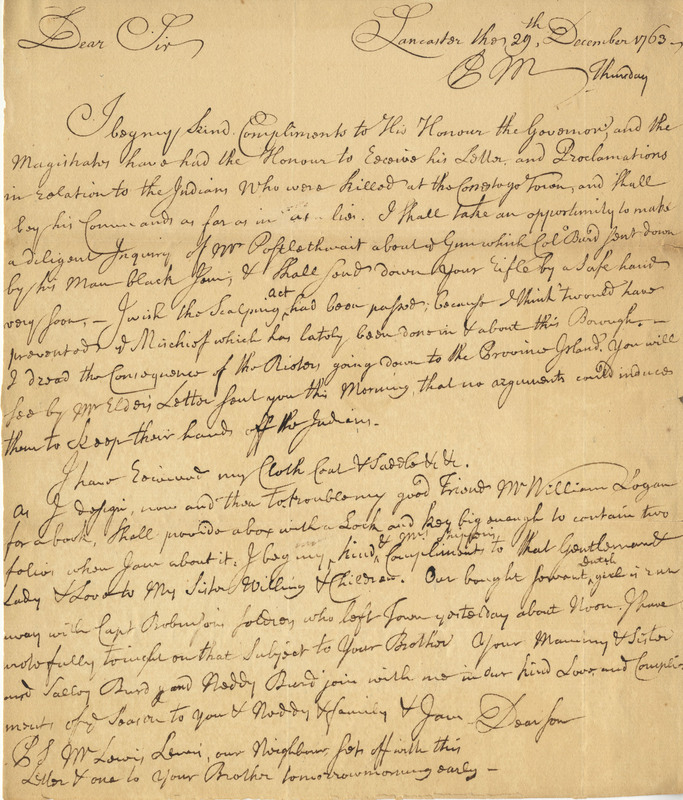 Thomas Penn and his brothers continued to negotiate with Indians they did not hesitate to use fraud and intimidation, most notoriously in the “Walking Purchase” of 1737, which robbed the Delaware Indians of a huge tract of land in Eastern Pennsylvania. In the West, meanwhile, on either side of the Susequehannah River, Native Americans faced an even greater threat from squatters, most of them Presbyterians of Ulster extraction. Ulster settlers began to arrive in Pennsylvania at the beginning of the eighteenth century, intruding on unpurchased Indian lands as squatters. They immediately came into conflict with the Penn family, who were both the rulers and landlords of the province. As early as 1730, a generation before the Paxton Boy massacres, a group of Ulster squatters temporarily occupied Conestoga Manor, declaring that it was “against the Laws of God and Nature that so much Land Should lie idle while so many Christians wanted it to labour on and raise their Bread.” (Reference "James Logan to John, Thomas, and Richard Penn" in Further Reading). Conflict between western colonists and Native Americans intensified during the French and Indian War (1754-63). Expelled from their native lands in eastern Pennsylvania, the Delaware Indians west of the Susquehanna River sided with the French as the lesser of two evils and launched devastating raids on settlers Pennsylvania. 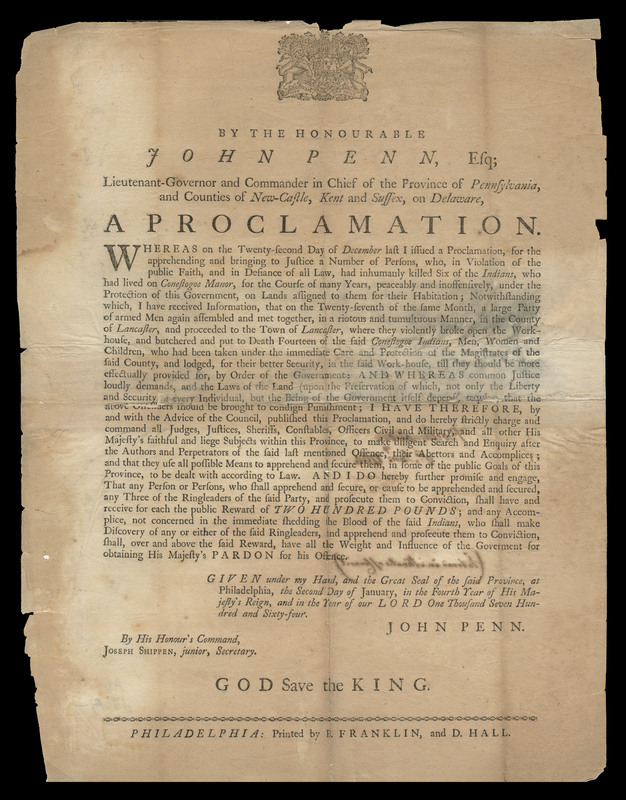 The provincial government responded by declaring war on the Delawares and, for the first time, establishing a provincial militia. 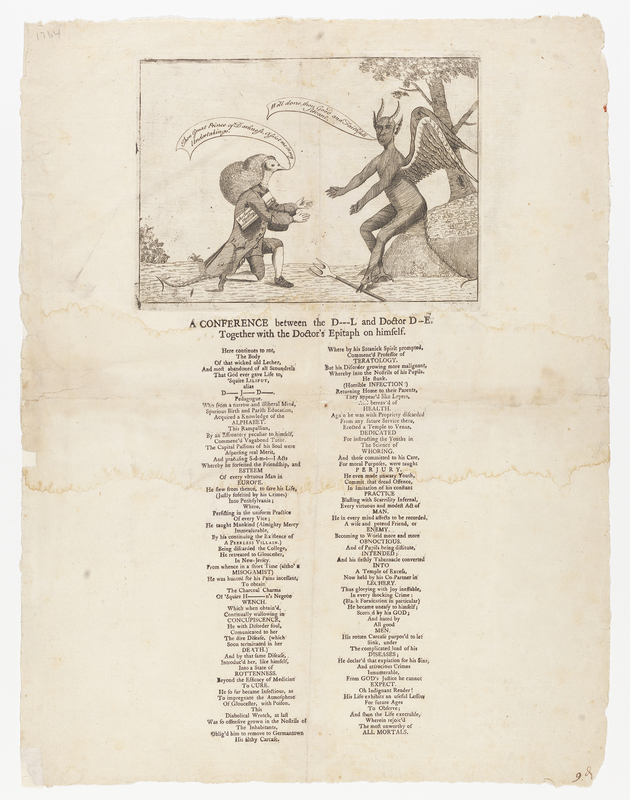 A handful of strict pacifist Quaker activists, led by Israel Pemberton, remained true to William Penn’s vision and protested vigorously, but the Peaceable Kingdom was at an end. Frontier settlers did most of the fighting and, from their perspective, both the Quaker-dominated Assembly and the proprietary executive branch seemed callously indifferent to their fate. 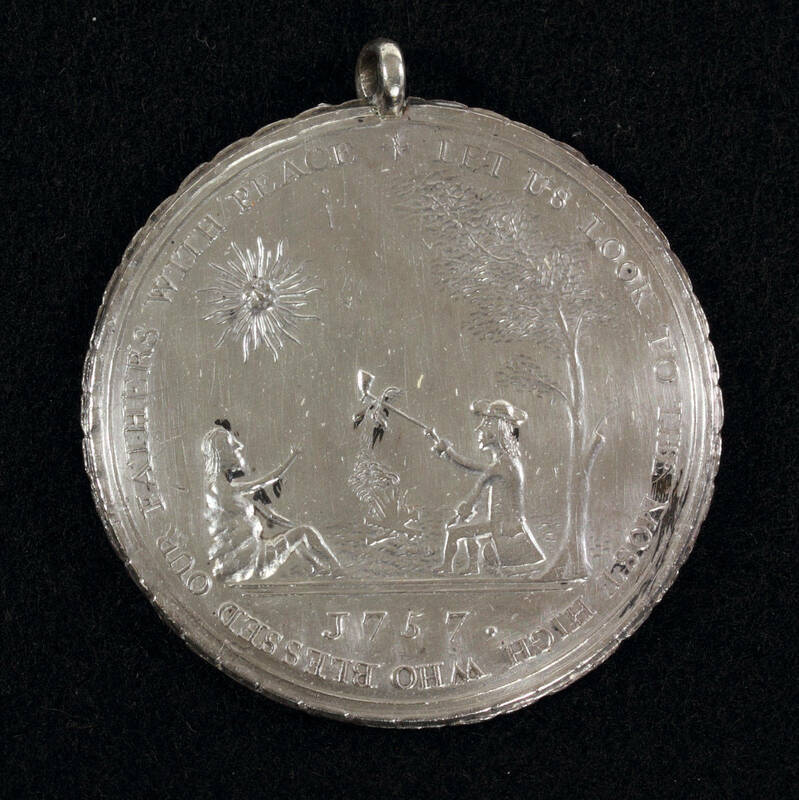 No sooner had the British secured imperial mastery over North America in 1763 than the short-sighted policies of Sir Jeffery Amherst helped trigger Pontiac’s War, the largest Indian rebellion in colonial American history. As Delaware and Shawnee Indians once again launched raids east of the Susquehanna River, embattled frontier settlers re-lived the nightmare of the French and Indian War. In December 1763 the Paxton Boys unleashed the full force of their accumulated rage against Indians and the provincial government by attacking the defenseless Conestogas. The Paxton Boys arose directly out of a local militia created by the government in response to frontier demands for defense. 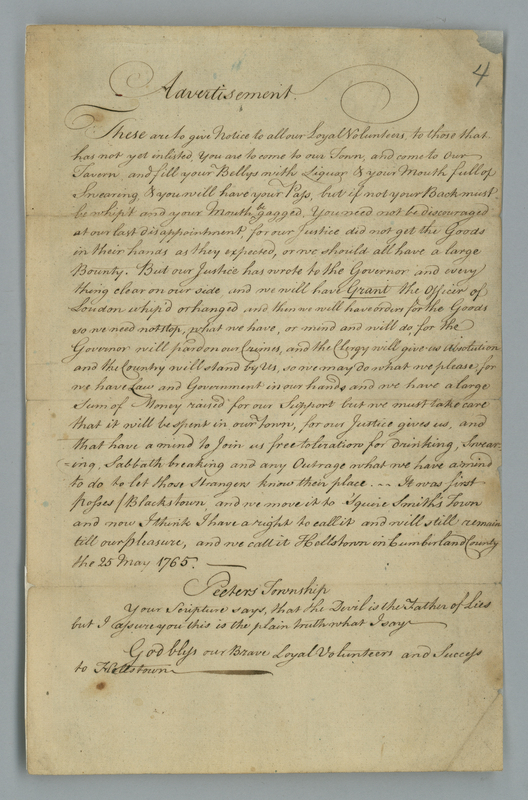 In the summer of 1763 the government authorized the creation of two militia units in the Susquehanna Valley, appointing the two leading Presbyterian figures in the valley to recruit and command them – Colonel John Armstrong of Carlisle and the Rev. John Elder, the “fighting pastor” of Paxton Presbyterian Church. These units had a strictly defensive function, but Elder and Armstrong used them to launch punitive raids against Delaware Indians. When these raids failed, the militiamen, known variously as the Paxtang Rangers and the Paxton Boys, attacked the Conestoga Indians instead. 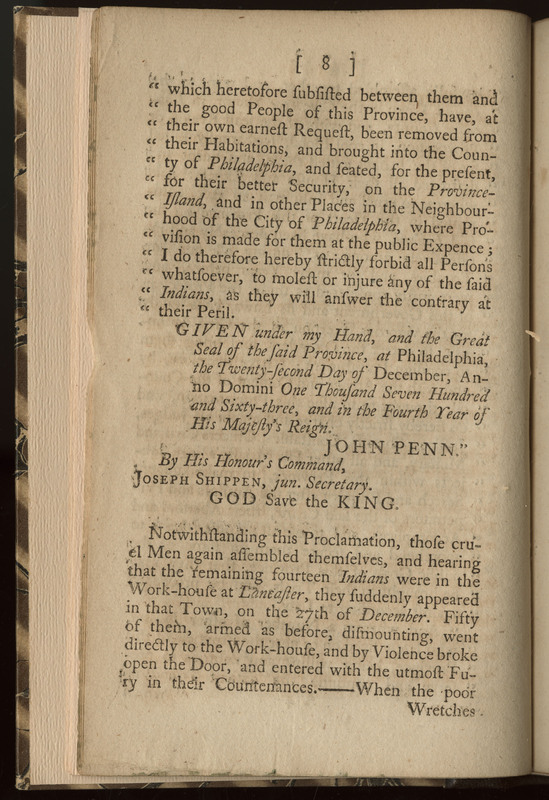 At the end of January 1764 reports reached Philadelphia that hundreds, perhaps thousands, of Paxton Boys were on the march, threatening to sack the city unless their grievances were met. They also demanded the right to “inspect” 140 Delaware Indians who had been removed from Moravian missions on the frontier and placed in protective custody in the city. 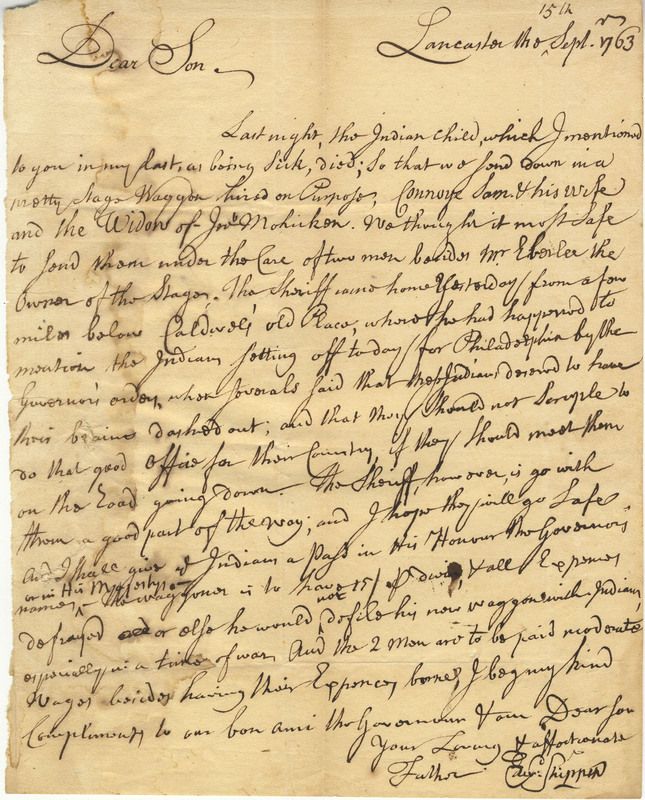 In the end, several hundred Paxton Boys reached Germantown, six miles outside Philadelphia, where a delegation led by Benjamin Franklin persuaded them to write down their grievances. Their spokesmen, Matthew Smith and James Gibson, submitted a Declaration and a Remonstrance for consideration by the provincial government. Instead of a war of weapons, a war of words ensued. 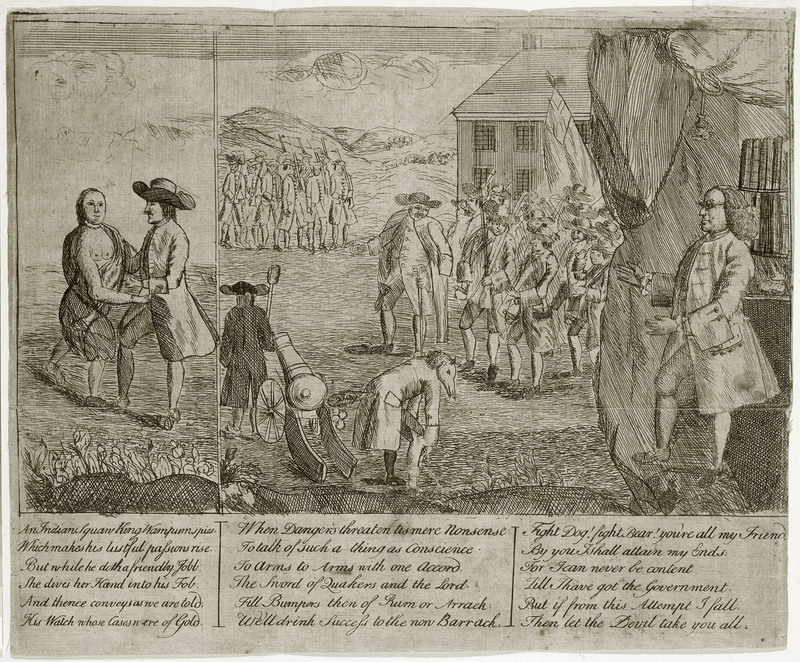 Presbyterian supporters of the Paxton Boys, in uneasy alliance with the Anglican faction surrounding the Penn family, did battle with Benjamin Franklin and the Quaker party. 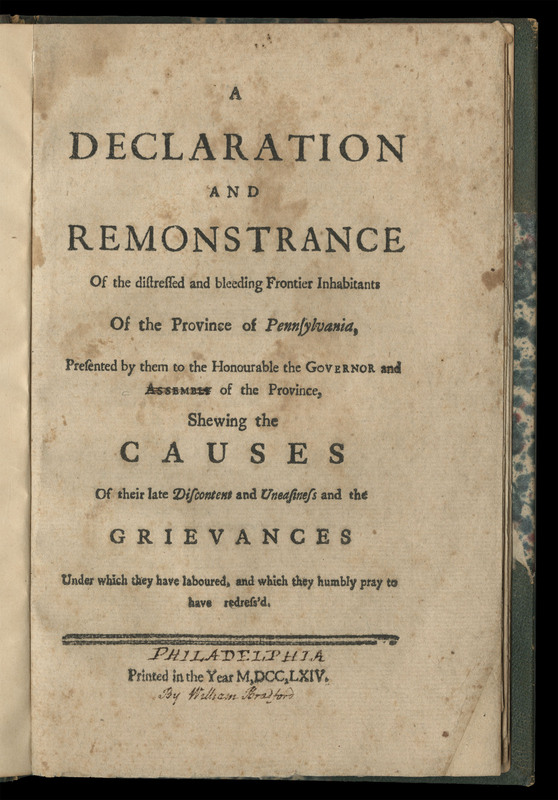 The debate, which featured more than sixty pamphlets and ten political cartoons, went far beyond the immediate issue of the Conestoga massacres to address the fundamental question of how Pennsylvania ought to be ruled. 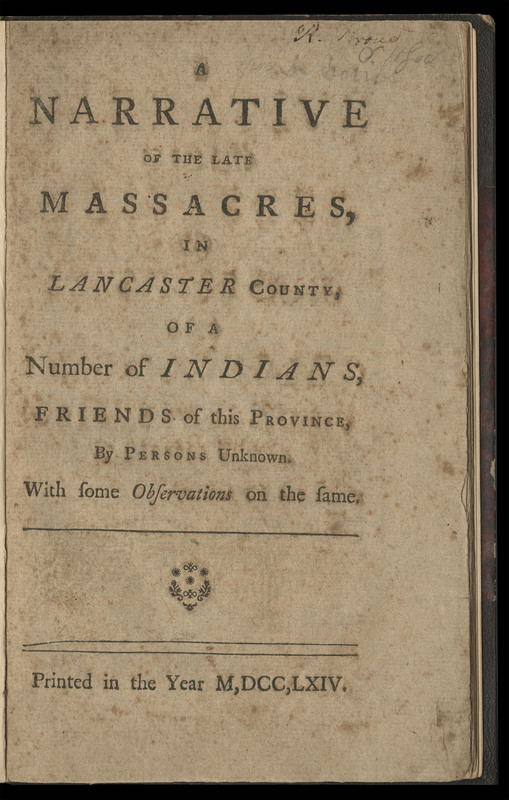 Franklin’s Narrative of the Late Massacres was the first pamphlet published. “If an Indian injures me,” Franklin demanded to know, “does it follow that I may revenge that Injury on all Indians? 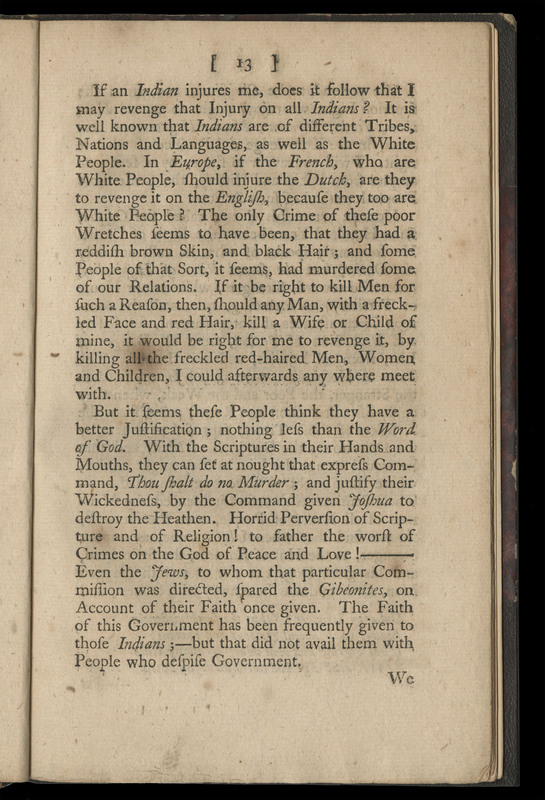 It is well known that Indians are of different Tribes, Nations, and Languages, as well as the White People.” If the French, “who are White People,” injured the Dutch, should the Dutch take revenge on the English “because they too are White People?” The Conestogas had committed no crime other than having “a reddish brown Skin, and black Hair; and some People of that Sort, it seems, had murdered some of our Relations.” By the Paxton Boys’ logic, if a man “with a freckled Face and red Hair” – the stereotypical Ulster complexion – should kill Franklin’s wife and child, it would be right for him “to revenge it, by killing all the freckled red-haired Men, Women and Children” he could find. Despite Franklin’s efforts, the Paxton Boys went unpunished. Nobody was investigated let alone arrested or prosecuted. The result was wave after wave of violence on the frontier, culminating in total war against Indians during the American Revolution. The Paxton Boys’ brutality was anomalous as late as 1763, in Pennsylvania at least, but during the Revolution it became commonplace. Most historians in the nineteenth century, and many in the twentieth, cast the Paxton Boys as harbingers of the American Revolution, frontier democrats fighting against the quasi-feudal privilege of the Penn family. The Paxton Boys did fight against proprietary privilege, but scarcely in the interest of liberty and equality for all. What they wanted was land, personal security, and vengeance against Indians. 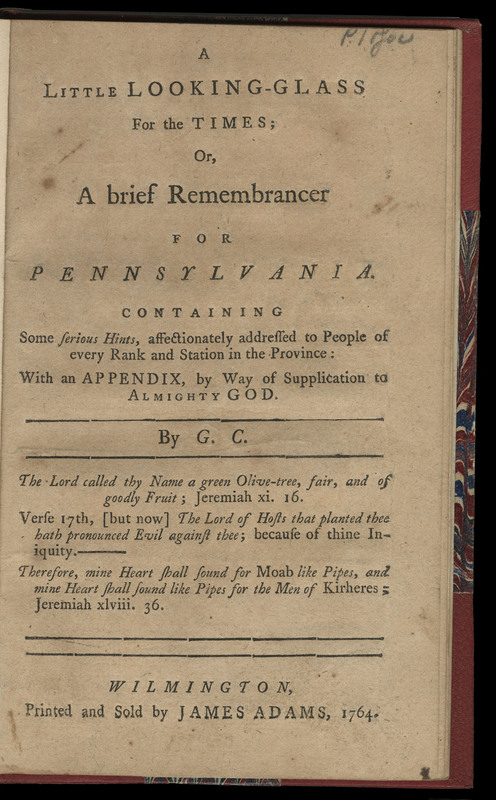 Earlier historians made much of the western counties’ underrepresentation in the Pennsylvania Assembly, which the Paxton Boys included as a grievance in their Remonstrance in 1764. But all of their other grievances concerned Indians. Political representation was an abstraction compared to the more fundamental need for self-preservation. The idea that the Paxton Boys were precursors of republican revolution is, however, accurate in one sense. The American Revolution did more than topple the proprietary government in colonial Pennsylvania. It also doomed the region’s Indians, who once again had opted to support the lesser of two evils – this time the British rather than the Americans, whose new nation, as they so clearly realized, could only engulf and destroy them. 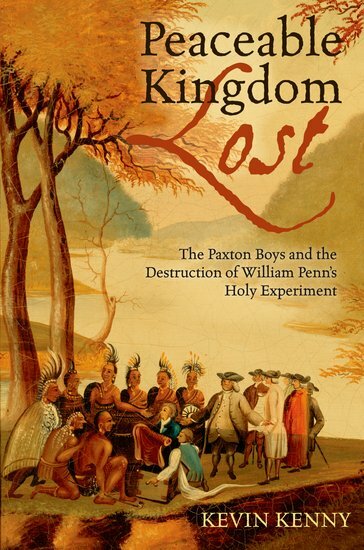 This essay is based on a book by Kevin Kenny, Peaceable Kingdom Lost: The Paxton Boys and the Destruction of William Penn’s Holy Experiment (Oxford University Press, 2009) © 2009 by Kevin Kenny. 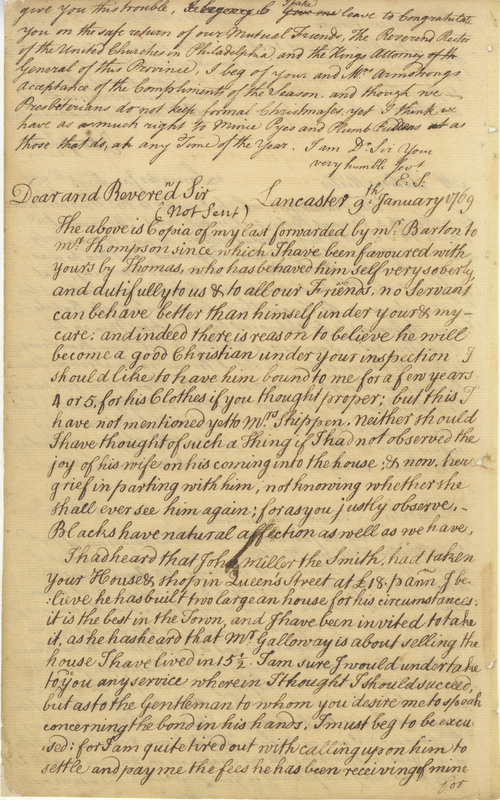 "James Logan to John, Thomas, and Richard Penn, February 17, 1731." Historical Society of Pennsylvania, James Logan letterbooks, vol. 3. 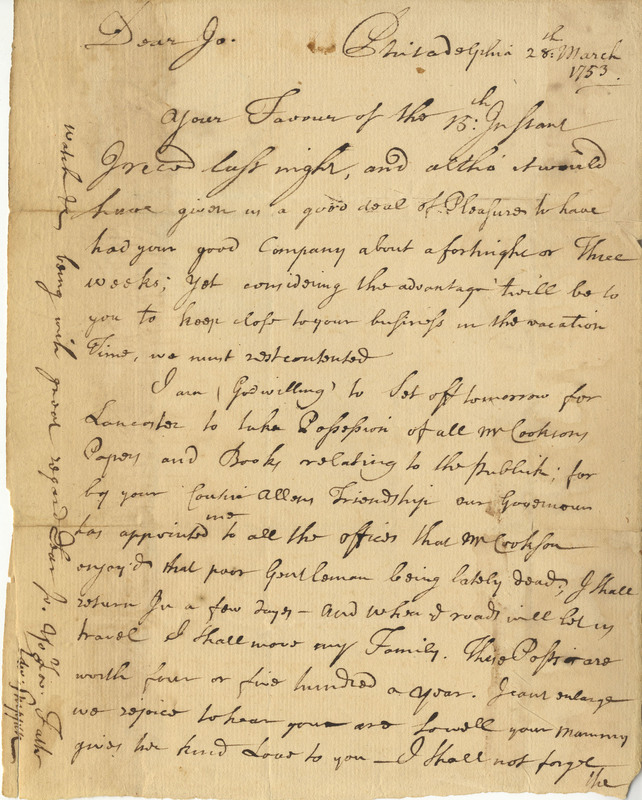 "John Penn to James Harrison, August 25, 1681." Mary Maples Dunn and Richard S. Dunn, eds, Papers of William Penn, 4 vols. (Philadelphia: University of Pennsylvania Press, 1981–1987), 2:108.